I often repeat that old bit of wisdom that the breakfast taco is the most important taco of the day but it is also a philosophy that I wholeheartedly subscribe to. It’s the taco that I long for, almost tragically, when my digestive fires start burning. I realized this week that although they show up in a lot of my guides, I haven’t done a wrap up since 2008 and there are a lot of new players since then. I don’t think we even had the Whole Foods taco back then. Isn’t it weird to think of a time when the Whole Foods was just a regular old health food store instead of a ridiculously packed megastore with mile long lines and even Japanese tourists? I wait in those long lines quite a bit for their monster of a breakfast taco. I like mine packed with tofu scramble, seasoned potatoes, and pico de gallo but others prefer the vegan chorizo, refried pintos, black beans, and now even steamed kale and Daiya. The key to their whole success, I think, is in their Margarita’s Tortillas. The spelt is one of my all time favorites but I also adore their pico de gallo. I don’t know how they manage to find good tomatoes all year long but they do it! If you like spicy food the new mango habenero salsa is delicious too. Even though Margarita has fantastic tortillas they can’t compare to my number one favorite homemade tortilla from a little Mexican trailer in my neighborhood off south first called La Flor. I read about this spot on Taco Journalism and ventured out there with the desperate hope that they didn’t use lard in their refried beans and I was granted with wonderfully cooked beans and the most sublime corn tortilla I have ever had in my life. It must be made by angels in the middle of the night. It’s filled with their delicious refried beans, seasoned potatoes, and nopales and then topped with their own green salsa. It’s the kind of taco that would make baby Jesus weep. */UPDATE 5/30/2010*/ My boyfriend was at La Flor today and heard that the beans weren’t vegan. I have questioned them extensively about lard and cooking with meat and they told me in the past that they used vegetable oil so as of right now I’m not sure who to believe so ask before you order. If you live in North Austin, I recently became totally hooked on a Mexican/ El Salvadoran restaurant introduced to me by the Lonestar Plate called Elsi’s. This little restaurant is the perfect place to avoid brunch chaos and hang out for awhile and enjoy the best veggie chorizo in town. The first time I went I followed Molly’s rec and got a bunch of sides to make my own taco and I still do that, but now I add fried plantains and guacamole and the last time I ate it I swore it was the best vegan taco in town. If you have any idea how much I hate driving across town, know that I will drive all the way to Burnett to eat this glorious taco. */UPDATE 5/7/2010*/ Soon after I wrote this post Elsi’s sadly closed down but there is hope that they might reopen in another location. In the meantime a new all vegan Taco trailer, the Vegan Nom opened on North Loop. I wrote about it here. If you live on the East Side, I still think your best bet is still Mr. Natural, and they are even open on Sunday now! I didn’t like their tacos at first because they have sprouts and lettuce on them. It took me several trips before I realized I could order whatever I want! They have a newly expanded menu and I am so stoked about the upcoming Serbian night! The Cherrywood Coffeehouse, also on the East Side supposedly has great tacos topped with shoestring potatoes but I have never tried it because they are always really really busy on the weekend, and by the time I get all the way over there I am hungry like a wolf so I can’t wait around all day. Wheatsville is a nice central option but I have never been too impressed by their tacos, even thoughI LOVE everything else there and think they are a really good deal. They have delicious salsa’s of the month and are the only place I can think of that even tries a tempeh taco but they can’t help but leave behind that “healthy” taste in my mouth so I usually opt for something else when I go there. 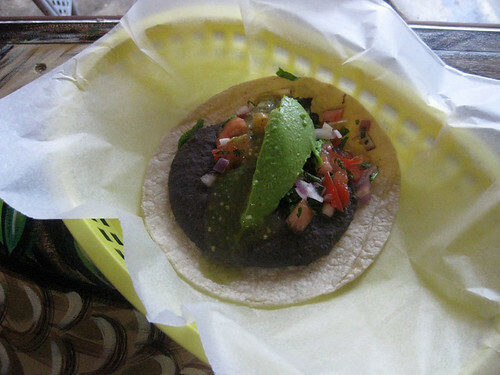 The best taco I’ve had on the west side is definitely the Freakin’ Vegan at Taco Deli. Even though it’s just beans and avocado their salsas are really outstanding and the one off mopac is a fun place to go before hitting trails on the Greenbelt. And now I realize that I would be remiss to not mention Bouldin Creek. 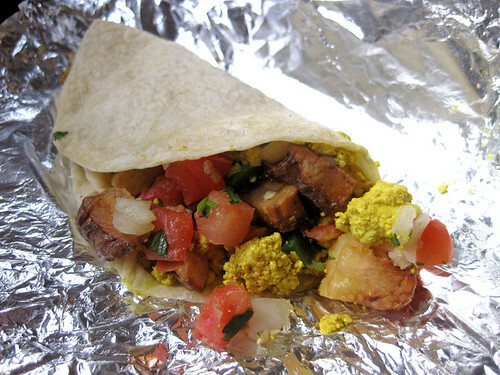 Many consider it the holy grail of a vegan breakfast taco and their tofu scramble is one of my most favorite foods in the world. But I’ve got to admit that their tacos have never been a favorite of mine. Their salsa is a little flat and the tortillas aren’t the best so while I love the scramble and the vegan chorizo, I’m probably just going to have it in it’s non taco form. Blasphemy, I know. If you don’t live in Austin, or you just don’t like leaving the house in the morning (I hear you) check out my post on how to make a breakfast taco. And Please let me know if you have any other favorites in the comments. We should have a vegan taco tour! 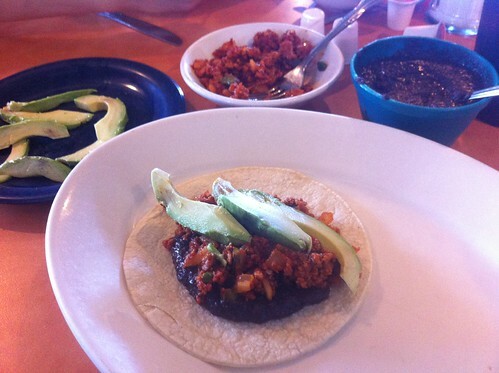 This entry was posted in Austin, Austin Guides and tagged Austin, breakfast taco, vegan on April 12, 2012 by lazysmurf. Wow- Now I want to go to Austin just to eat tacos. Now to propose this idea to my husband… 🙂 Thank you for the info! 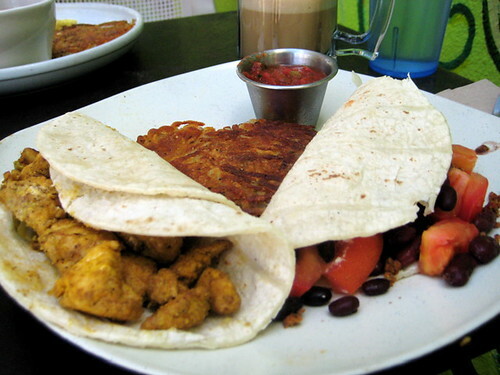 You should try El Meson for brunch on weekends. Best guacamole in town. I like the ready-made breakfast tacos at Wheastville on weekday mornings. Of course, the fact that I can pick up a vegan taco and cup of coffee on my way to work while I’m half asleep might be influencing my opinion. 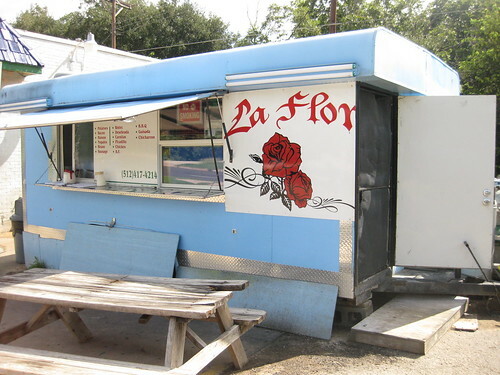 I can’t wait to try the tacos at La Flor now!